​I don’t know about you, but I love looking off dams. It is the combination of scenic canyons and geology, powerful water flows, scary heights, the engineering marvel of man harnessing nature, the production of clean power, the massive spring runoff captured for a thirsty state, and finally the significant investment made for the benefit of future generations. It just feels good! The Rocky Mountain West is a dry place. Wyoming is a land of alpine mountains and semiarid to arid sage covered basins that historically served as a place “in between.” It was not a destination but rather an area people passed through on their way to somewhere else. Passengers on the Transcontinental Railroad in 1900 thought the state was “... a barren wilderness of withered grass and stunted sage-brush, with an abundance of rugged mountain(s) ...” (Smith, W., 1900, The Conquest of Arid America, p. 207). Wyoming is the tenth largest state geographically but remains the least populated in the United States. Geologist John Wesley Powell identified the 100th meridian (line of longitude) as the climate divide between the arid west and the humid east. Powell understood in his 1878 “Report on the lands of the arid region of the United States,” that settlement west of the line would require the government to account for the regions aridity in development plans. The 100th Meridian division of precipitation (left) and population (right) of the United States with location of the North Platte in southeastern Wyoming displayed. The start of the arid zone has shifted 140 miles eastward to the 98th Meridian, based on temperature, wind and precipitation data measurements since 1980. Image: Left: https://www.earthmagazine.org/article/dividing-line-past-present-and-future-100th-meridian; Right: http://www.dailygalaxy.com/my_weblog/2018/04/todays-top-science-headline-100th-meridian-arid-dry-climate-of-western-us-shifting-eastward.html. ​Water is arguably the state’s most valuable resource because water is the main constituent of all organic life. It accounts for 60-90 percent by weight of living organisms.Wyoming is located over the continental divide and therefore is the headwaters region for four major river basins in the west: 1) Missouri-Mississippi, 2) Green-Colorado, 3) Snake-Columbia, and 4) Great Salt Lake. Where rivers flow there is a swath of green across the landscape (at least during the Spring runoff). Most of the water comes from the winter snowpack high in the ranges that surround the basins. The mountain sources are the birthplace of streams, that are the arteries of life for this arid land. Major river basins draining Wyoming, percentage of land area drained, and final drainage location: 1) Missouri-Mississippi, 72%, Gulf of Mexico, 2) Green-Colorado, 17%, Gulf of California, 3) Snake-Columbia, 5%, Pacific Ocean, and 4) Great Salt Lake, 2%, closed basin. Four percent of Wyoming’s land lies within the Great Divide Basin, a part of the Red Desert. This is an area of internal drainage that does not leave the basin. It is named Great Divide Basin because the continental divide (thick black and white dotted line) splits and surrounds the area. 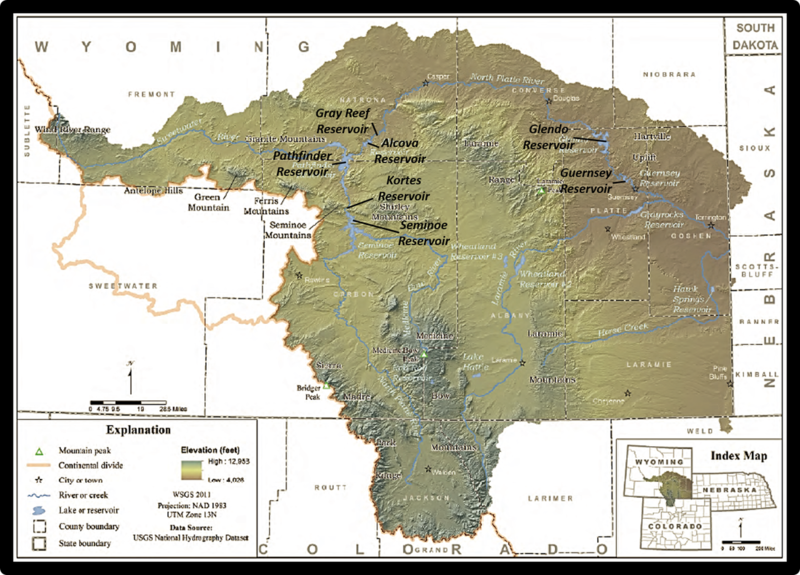 The South Platte River Basin is also part of the Missouri-Mississippi River Basin. North Platte reservoirs: AR: Alcova Reservoir, GR: Guernsey Reservoir, GlR: Glendo Reservoir, GRR: Gray Reef Reservoir, KR: Kortes Reservoir, PR: Pathfinder Reservoir, SR: Seminoe Reservoir. ​The headwaters of the North Platte River are at the confluence of Little Grizzly Creek and Grizzly Creek. These streams emerge from the snow fields on the eastern flank of the continental divide mountains surrounding North Park, Colorado. The North Platte enters Wyoming through Saratoga Valley between the Sierra Madre and Medicine Bow Mountains at 7,755-foot elevation. The stream flows northward across the Carbon-Hanna Basin, carves canyons through the Laramide mountain ranges at Seminoe and Granite Mountains and several anticlinal structures on the western side of the Laramie Range. 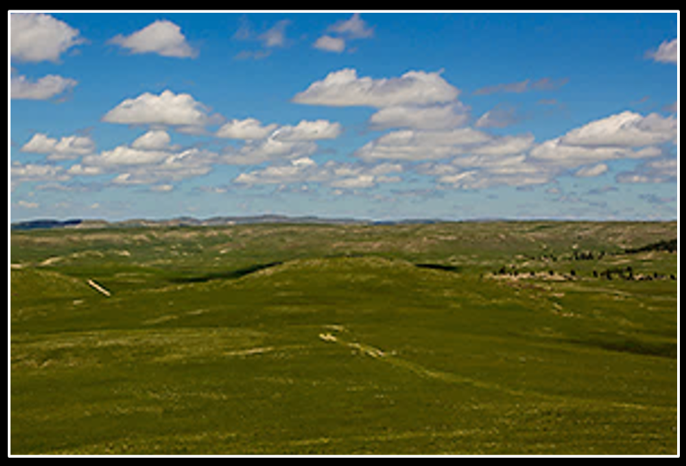 It turns east in the Powder River Basin around the north flank of Casper Mountain, then flows southeast toward the Great Plains where it carves across the Hartville Uplift before exiting the Cowboy State into Nebraska at 3,725-foot elevation. The North Platte and South Platte merge to form the Platte River that drains into the Missouri-Mississippi system at the Iowa/Nebraska border. The 429-mile “big loop” water route through southeastern Wyoming crosses the Southern Rocky Mountain, Wyoming Basin, and Great Plains physiographic provinces of America. North aerial view of the North Platte River’s seven reservoirs area. Transcontinental railroad route across southern Platte River Basin shown by white track symbol. Emigrant Trail route shown by dashed white line. Dam abbreviations: SD: Seminoe Dam, KD: Kortes Dam, PD: Pathfinder Dam, Ad: Alcova Dam, GRD: Gray Reef Dam, GlD: Glendo Dam, and GD: Guernsey Dam. North Platte River elevation profile across southeastern Wyoming. Image: Data digitized from Google Earth. Physiographic Map of the North Platte Basin and it’s seven dammed reservoirs. The population was about 8,000 citizens (non-native) when Wyoming became a territory of the United States in 1868. The Transcontinental Railroad construction had reached the town of Rawlins Springs. Traffic on the emigrant trails was dwindling. The population was concentrated along the path of the railroad in southeastern Wyoming. Army soldiers stationed at forts, cowboys working on open range cattle operations, miners seeking wealth in the mountains and valleys, and a few hardy homesteaders taking advantage of federal land disposal acts made up the rest of the Territory’s population. All these individuals were located near the Territory’s surface streams. Manifest Destiny was a widely held concept in 19th century America. The term was first used by John L. O’Sullivan to support the annexation of Texas and Oregon. He believed America had a mission to spread democracy throughout America. John Gast’s painting “American Progress” captured the mood of the country. John Gast’s “American Progress” (1872) is an allegorical representation of Manifest Destiny. Except for a lack of stock growers, it mirrors the Wyoming Territory’s path to statehood. The United States (as Lady Columbia in the center) brings light to the West carrying a school book of knowledge and stringing telegraph wire for rapid communication (so long Pony Express). The dark savage West of bear, bison and Indians recedes on the left. Columbia is preceded by explorers, trappers and miners (lower center left), wagon trains and emigrants in a Prairie Schooner (center left). A Pony Express rider is just above her left knee. In her wake come farmers using the steel-point plow to farm the land (lower right), stage coach and railroads (right center). River navigation and bridge construction is represented on the far right with the rising sun. 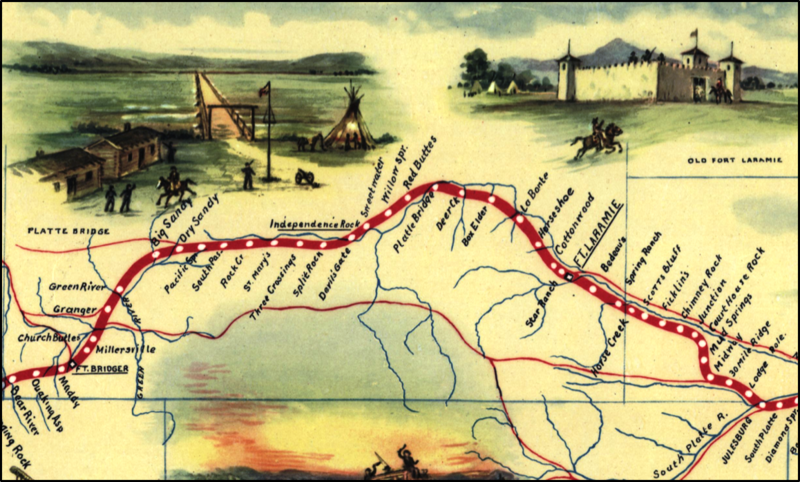 The Wyoming portion of William Henry Jacksons’ pictographic map “The Pony Express” The route of the Pony Express closely followed the North Platte-Sweetwater Rivers Emigrant trail across the North Platte River Basin. The short-lived (April 3, 1860 – October 24, 1861) mail route was made obsolete by the telegraph. Historical note: image of "Old Fort Laramie" is actually a sketch of "Fort William" that existed before the army purchased the property in 1849. Image: Library of Congress, https://www.loc.gov/resource/g4051p.tr000221/?r=0.406,0.024,0.294,0.172,0. ​Nineteenth Century Americans held two opposing theories about the western lands. The land was either “The Garden of the World”(C.W. Dana, 1856) or “The Great American Desert”(Zebulon Pike, 1810). The path of the North Platte River and its tributary the Sweetwater River was the route west for up to half million emigrants in the 19th Century. They did not think the area was suitable for settlement or dryland farming due to the climate (aridity and temperature extremes), isolation (Indians, distance to supplies and market), and topography (elevation and soil development). Countering this view was the theory that “the rain follows the plow.” This view was supported by Ferdinand Hayden (explorer), William Gilpin (first territorial Governor of Colorado), and Samuel Aughey (minister, scientist, professor of natural science). The latter also served as Wyoming’s first territorial geologist. But the hard truth of arid land experience showed rain is not influenced by the plow. TheTranscontinental Railroad required not only abundant water for the steam powered locomotor, but also coal for fuel and a gentle topographic grade. The surveyors discovered a suitable passage in southeastern Wyoming that became known as The Gangplank. Here a natural ramp sloped upward from the plains to the crest of the mountains. The Gangplank on east side of Laramie Range. Here preserved Tertiary fill laps onto the crest of the mountains creating a relatively smooth topographic slope that the trains can climb. The Cheyenne tablelands are shown in yellow. 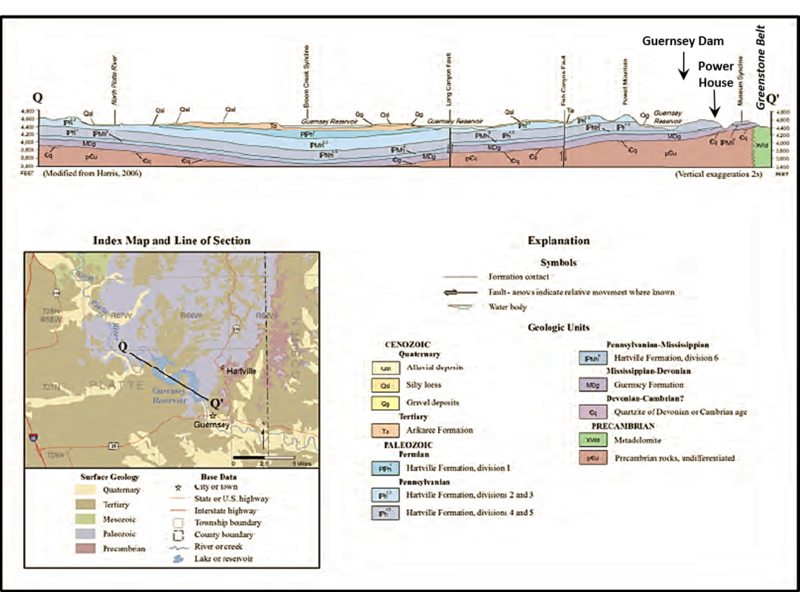 Image: Left: After Blackstone, D.L., Jr., 1996, Structural geology of the Laramie Mountains, southeastern Wyoming and northeastern Colorado: Wyoming State Geological Survey Report of Investigations 51, 28 p., 3 pls., scale 1:500,000, http://www.wsgs.wyo.gov/products/wsgs-1996-ri-51.pdf; Right: https://visitlaramie.org/railroads-of-albany-county-tracking-the-past-brochure. The winter 1886-1887 is noted for its severity and cattle mortality in the Rocky Mountains. The cattle barons lost up to 25 percent of their livestock (some exaggerated claims report 90 percent loss). Stockmen began to rethink open range grazing. They began to employ better range management by reducing herd population and fencing grazing area, and water irrigation that provide stock water and winter feed. Charles Russell’s “Waiting for a Chinook: the last of 5,000” captured the brutal winter where thousands of open range cattle died from exposure, dehydration and starvation. Elwood Mead, formerly Professor of Irrigation Engineering at Colorado State Agricultural College (now Colorado State University), is the person most responsible for organizing Wyoming’s water laws. He served as the first Territorial and State Engineer (1888-1899). He drafted the Wyoming’s Constitution section on water law that included state ownership of water, established a board of control to administer four water divisions and the concept of “beneficial use” as the basis and limit to priority appropriations. Wyoming’s water law became a model for other western states. “Wyoming’s place as the [water] lawgiver of the arid region is due neither to geographical location or to superior natural resources; certainly, it is not due to large population. It owes its commanding position solely to the character and ability of a few public men who happen to have found in this line of work their best opportunity for usefulness.” (Smith, W., 1900, The Conquest of Arid America, p. 221). Water divisions of Wyoming’s Board of Control. The North Platte River system is in Division 1 (green area). The U.S. Reclamation Service established in 1902 (U.S. Bureau of Reclamation since 1923), was the agency tasked with the federal commitment to design and construct water development projects in 16 western states with federal lands (a concept first promoted by Powell, 1878). Beneficiaries would repay the government with annual installments over a ten-year period. All seven dams along the North Platte River were constructed as part of a reclamation project. In selecting dam locations, the bureau considered the type and cost of construction at each site. Several geologic factors affected the decision, including topography, rock type of foundation, earthquake hazard and volume of water available. The North Platte basin consists of narrow V-shaped canyons in basement rock suitable for arch type dams and hilly, plains conducive to earth-filled dams. Both dam types were constructed along the river’s course. 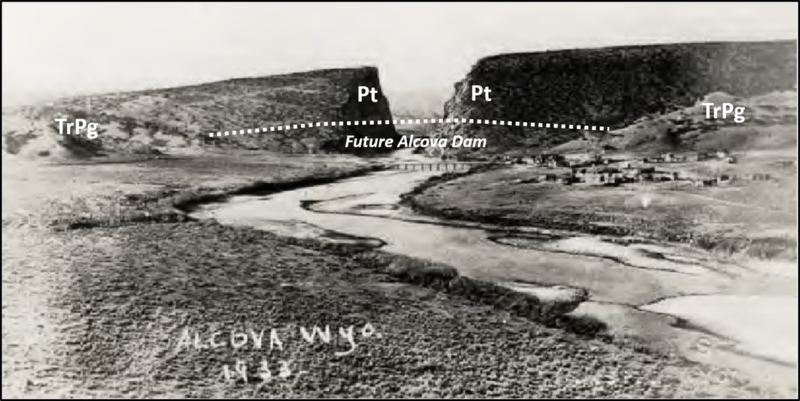 ​North Platte Landforms - Top: V-shaped valley in Black Canyon at Seminoe Dam site in 1935: The arrows represent the direction of water runoff. Water flows downhill into the stream and erodes the valley into its V shape. Bottom: hilly plains in Glendo area. Image: Top: https://www.wyohistory.org/encyclopedia/history-seminoe-and-kortes-dams; Bottom: Clark and Associates photo of Meadowdale Ranch Property, http://clarklandbrokers.com/ranches-for-sale-in-wyoming/. Timeline of Wyoming’s agricultural development and water use. The North Platte River Basin has the largest volume of irrigated land. Image: After Brown, R.H., 1980, Wyoming: Westview Geographies of the United States, Fig. 7.2, p. 155. Dams along the North Platte River: 1. South view of Seminoe and Kortes Dams, 2. Southwest view of Pathfinder Dam, 3. West View of Alcova and Gray Reef Dams, and 4. Southeast view of Glendo and Guernsey Dams. Faults shown by red lines: reverse faults: Sawteeth on upthrown block with teeth pointed in the direction of fault surface dip; normal faults have line and ball symbol on downthrown block. 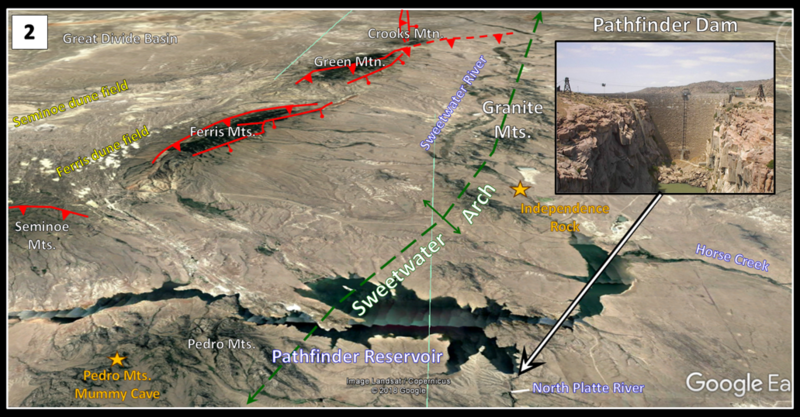 Notation: CB: Cheyenne Belt, THO: Trans-Hudson Orogen, HF: Hartville Fault. 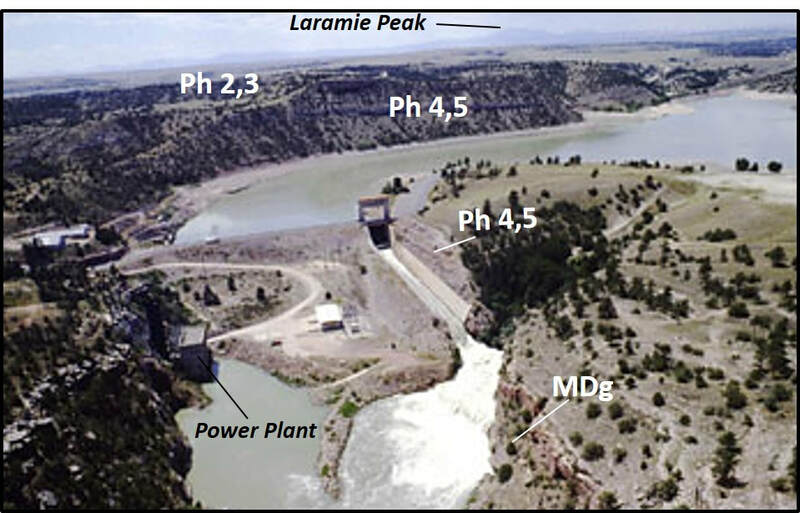 Images: U.S. Bureau of Reclamation, http://waterplan.state.wy.us/plan/platte/2006/techmemos/TechMemo_2-6_FINAL.pdf; Guernsey Dam: https://www.usbr.gov/gp/wyao/spill/gurensey.jpg. 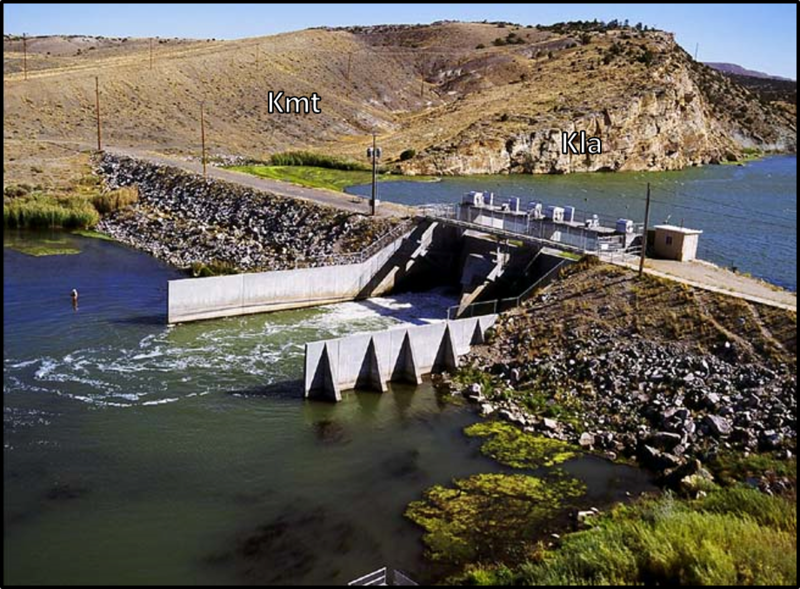 Key details on the North Platte River basin dams. 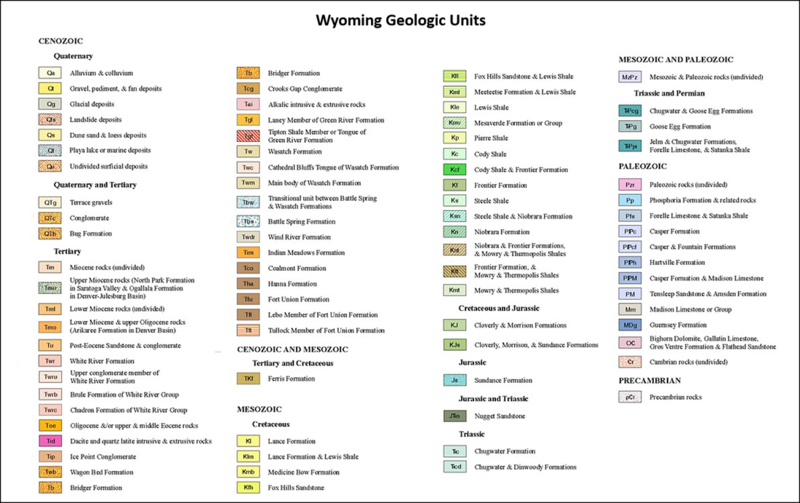 The geologic structure of Wyoming was created 75 to 50 million years ago during the Laramide Orogeny. The fabric of the Precambrian basement influenced the location and orientations of the Laramide structures. Sediment eroded from the uplifts filled the basins, topped the mountains and extended eastward onto the Great Plains. Ancestral streams flowed across this high-level surface stripping away the Tertiary fill and carving canyons through the mountains and structures. Stream superposition across a Laramide structure. 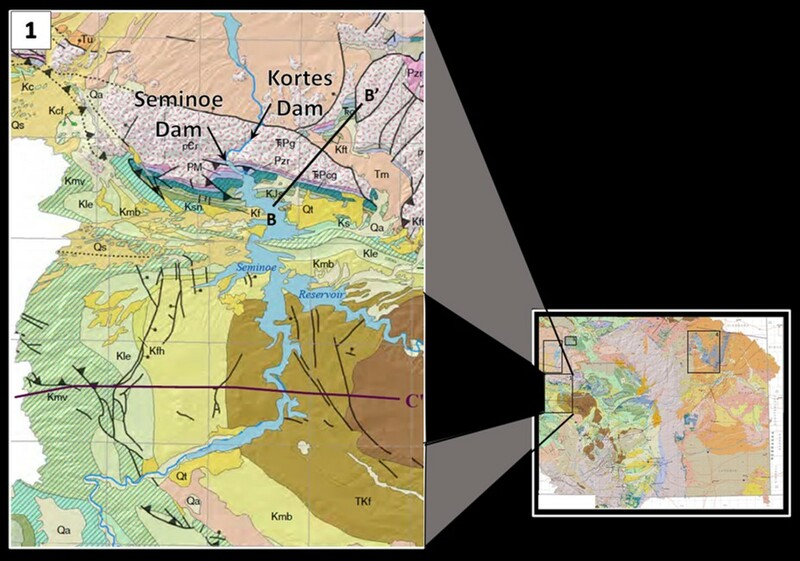 Top: Latest Eocene through mid-Miocene time: Progressive filling of basins with ash from remote eruptions; onset of regional uplift and normal faulting; meandering streams crossing buried parts of mountains; Bottom: Late Miocene through Holocene time: Excavation of basins-fill sediments and superposition of stream accompanying uplift. ​The dominant Precambrian structure in central Wyoming is the Sweetwater Arch trending east-west at the southern margin of the Wind River Basin. This feature formed by the intrusion of granite plutons 2.62 billion years ago, over a 125-mile area. The consistency of lithology and age range has given rise to the term Wyoming Batholith applied to the region (Bagdonas et al., 2016). The batholith is the exposed core of an ancient silicic magma chamber. Other basement rocks on the flanks of the arch include a 3.3-3.0 billion year gneiss (developed along the Oregon Trail accretion belt) and 2.7-2.6 billion year old greenstone/granitic terranes on the north (Rattle snake Hills) and south (South Pass, Seminoe Mountains) margins. The U.S. Bureau of Reclamation projects west of the Laramie Range are all located in the Southern Accreted Terrane of the Wyoming Craton. The projects on the east side are in the Sweetwater subprovince (Glendo) and the Hartville Uplift-Black Hills subprovince (Guernsey). Tectonic map showing major structures of the Sevier and Laramide orogenies, the subprovinces boundaries of the Wyoming Craton and the location of the North Platte River drainage. Subprovince codes: BBMZ: Bighorn-Beartooth Magmatic Zone, SW: Sweetwater terrane, SAT: Southern Accreted Terrane, HU-BH: Hartville Uplift-Black Hills terrane, ST: Selway Terrane, CPO: Central Plains Orogen. 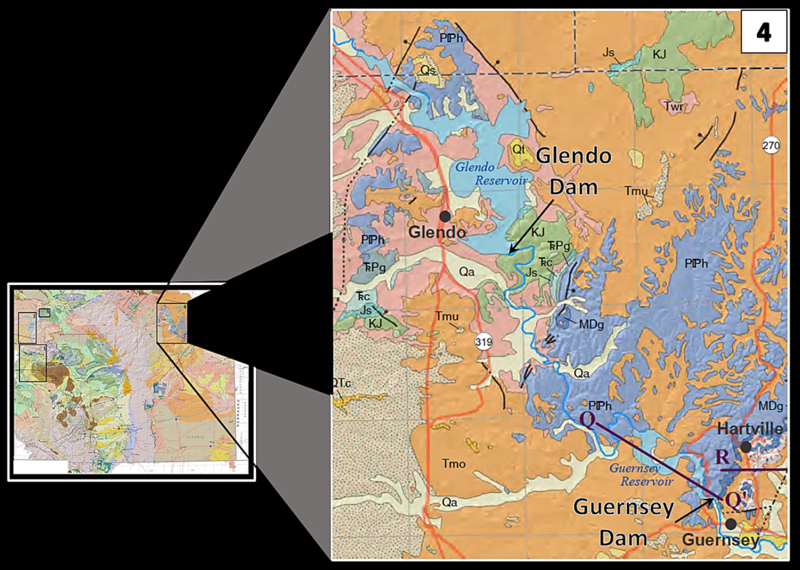 Black rectangles indicate, Left: the western area of the Sweetwater Arch with surrounding greenstone belts, Laramide age structures and dammed reservoirs; Right the eastern area of Glendo and Guernsey dams and the southern portion of the Hartville Uplift. Image: After Platte River Basin Water Plan Update Groundwater Study Level I (2009-2013): Wyoming State Water Plan, http://waterplan.state.wy.us/plan/platte/2013/gw-finalrept/plate_1.pdf. Seminoe Mountains structural cross section B-B’. The line of section is about two miles southeast of the dams. Section does not show the Laramide-age, south-directed reverse fault that elevated the mountains. The down to the north fault on the northeastern margin has many names. Geologic code: Qal: Quaternary alluvium, Qu: Quaternary undifferentiated deposits, Qtr: Quaternary terrace gravel, Kc: Cretaceous Cloverly Formation, Jms: Jurassic Morrison and Sundance Formations, Trc: Triassic Chugwater Group, Trca: Triassic Alcova Limestone, TrPg: Triassic and Permian Goose Egg Formation, Pt: Pennsylvanian Tensleep Sandstone, PMa: Pennsylvanian and Mississippian Amsden Formation, Mm: Mississippian Madison Limestone, DCff: Devonian Fremont Canyon Quartzite and Cambrian Flathead Quartzite, Wd: Archean diabase, Ww: Archean white granite, Wkd: Archean granite of Kortes Dam, Wsd: Archean granite of Seminoe Dam, Wld: Archean granite of Larkin Dome (Wyoming Batholith), Wgg: Archean granite gneiss, Wam: Archean amphibolite. Aerial photo of Seminoe Dam site. Geologic codes: Pt: Pennsylvanian Tensleep Sandstone, Mm: Mississippian Madison Limestone, DCff: Devonian Fremont Canyon Quartzite and Cambrian Flathead Quartzite. Red lines show faults: thrust fault have sawteeth on upthrown block, normal fault has stick and ball on downthrown block. Image: Love, J.D., 1970, Cenozoic Geology of the Granite Mountains Area, Central Wyoming: U.S. Geological Survey Professional Paper 495-C, Fig. 46, p. C104, https://pubs.usgs.gov/pp/0495c/report.pdf. 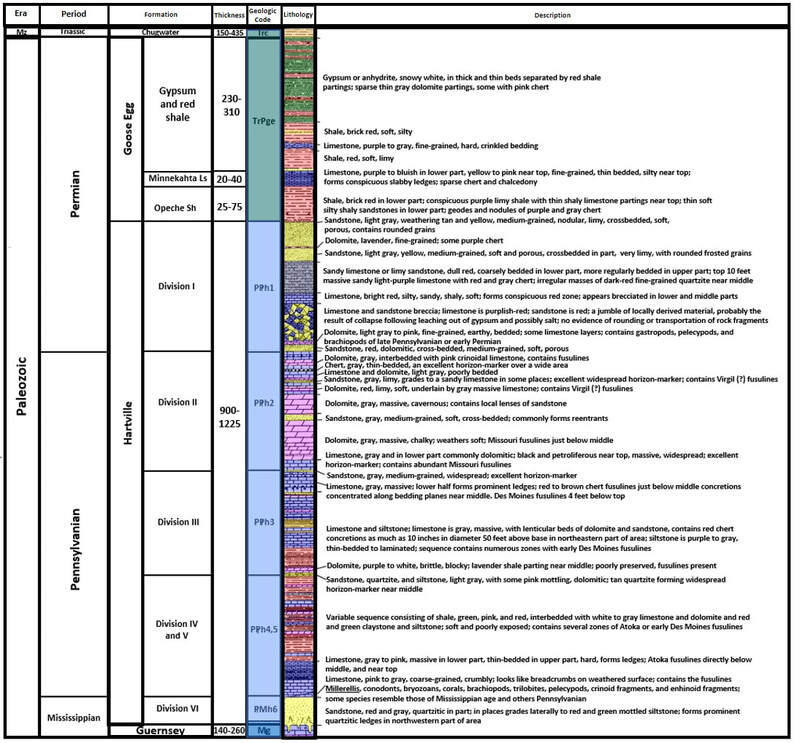 Stratigraphic column for Seminoe and Kortes dam sites. 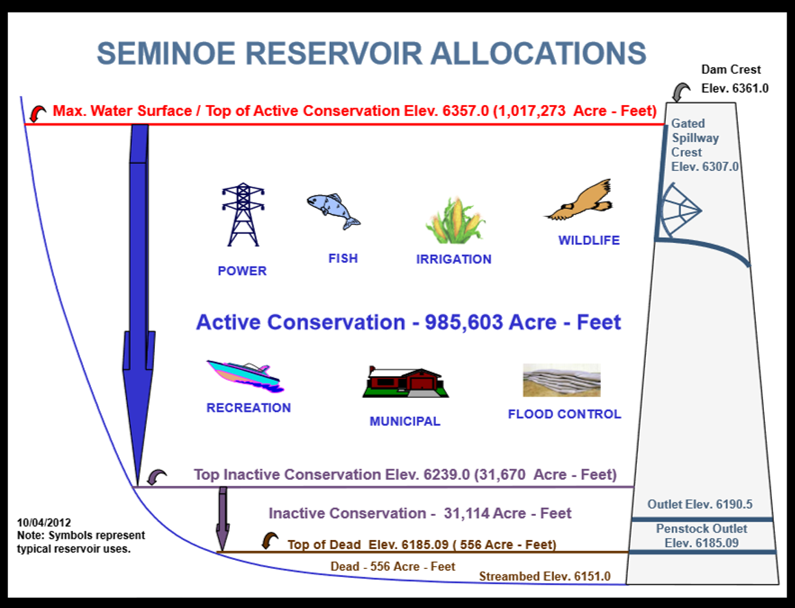 Water allocations for Seminoe Reservoir. The Miracle Mile of the North Platte River. Image: Reef Fly Shop photo, https://www.northplatteflyfishing.com/fishing-guide/fishing-destinations/miracle-mile-fishing/. South view of Kortes Dam. 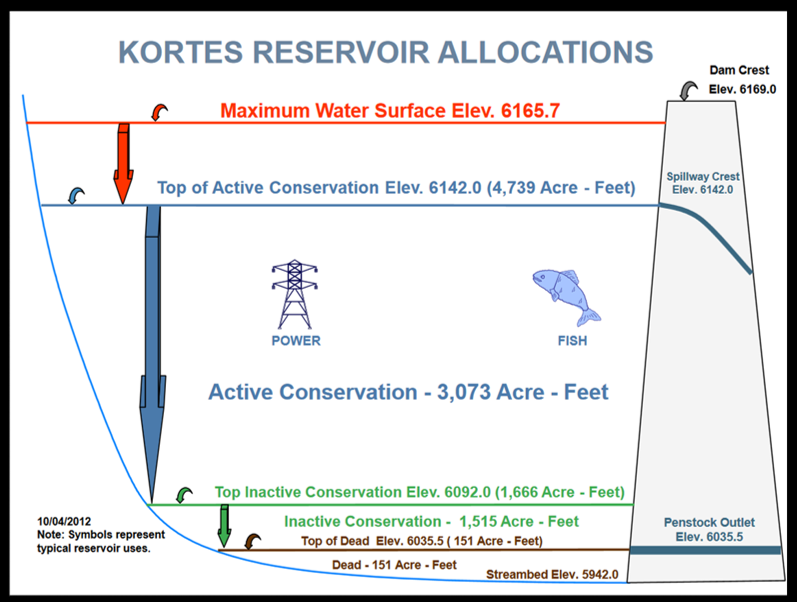 Water allocations for Kortes Reservoir. ​Pathfinder is the third dam located along the North Platte and the first to be constructed in the North Platte River Basin. The structure was named after the nickname of John C. Fremont (historical note: Kit Carson was the actual guiding “Pathfinder” in the party). Fremont records a description of the canyon and his harrowing water passage through it in his journal“The exploring expedition to the Rocky Mountains, Oregon and California” (https://babel.hathitrust.org/cgi/pt?id=aeu.ark:/13960/t4fn1zv6j;view=1up;seq=8). The dam was constructed at thesouthern mouth of Fremont Canyon in the northeastern portion of the Granite Mountains. It is about three miles downstream from the confluence of the Sweetwater and North Platte Rivers and eight miles north of Seminoe Dam. The foundation bedrock is an exposed portion of the Wyoming Batholith. The reservoir backfills portions of both streams above their confluence. Spring runoff was heavy in 1909 and concerns were raised that the new dam might fail. As a precautionary measure 5 drill holes charged with dynamite were place near the top of the dam. This would allow the engineers a failsafe to blow an opening in the dam to allow escape of water and prevent dam failure. As the flood waters receded, so did the memory of the dynamite charges. They remained in place until they were rediscovered in 1949 when the explosives were removed from the dam. The eastern margin of the reservoir lies adjacent to the Pedro Mountains. This uplift is also part of the Wyoming Batholith. Here the mummified remains of a Native American infant were discovered by two prospectors in 1932. Their discovery gave rise to tales of a race of little people living in the area. The remains were lost in 1950, but that did not stop speculation that continues today. Late Archean granite of the Wyoming batholith exposed at Pathfinder Dam site in Fremont Canyon. 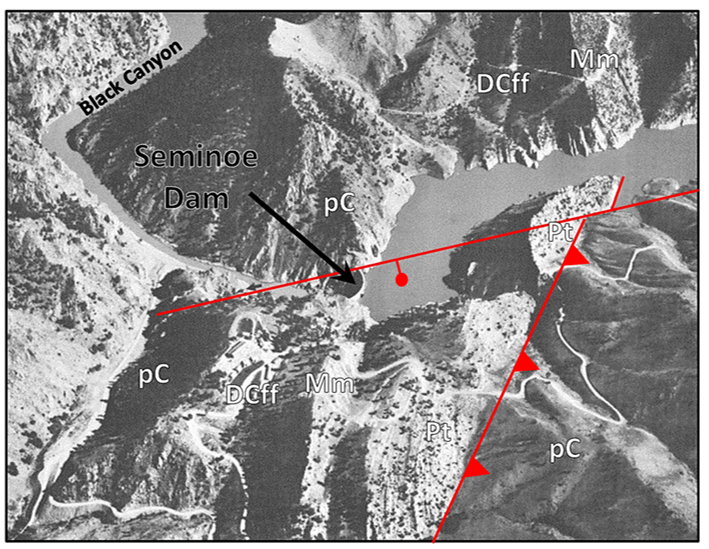 Dam Location shown by white dashed line. Geologic codes: pCd: Precambrian diabase (dike), pCr: Precambrian rock (granite). Fremont Canyon stratigraphic column. 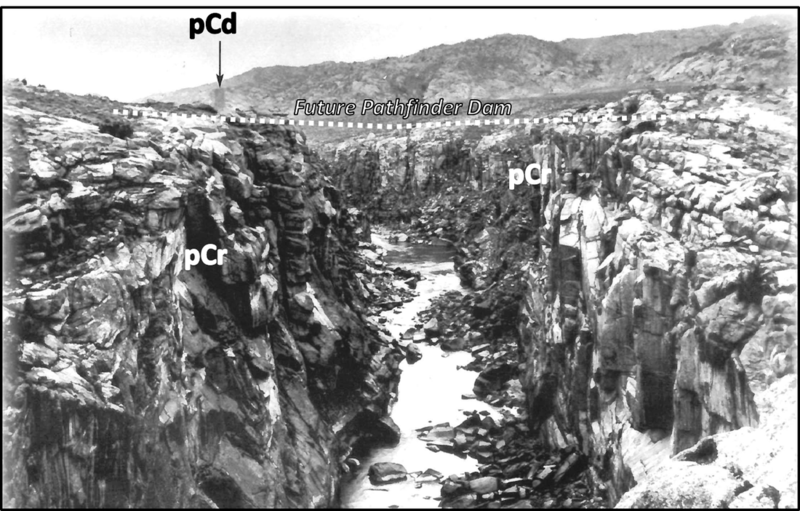 Pathfinder Dam was constructed on the Precambrian granite. 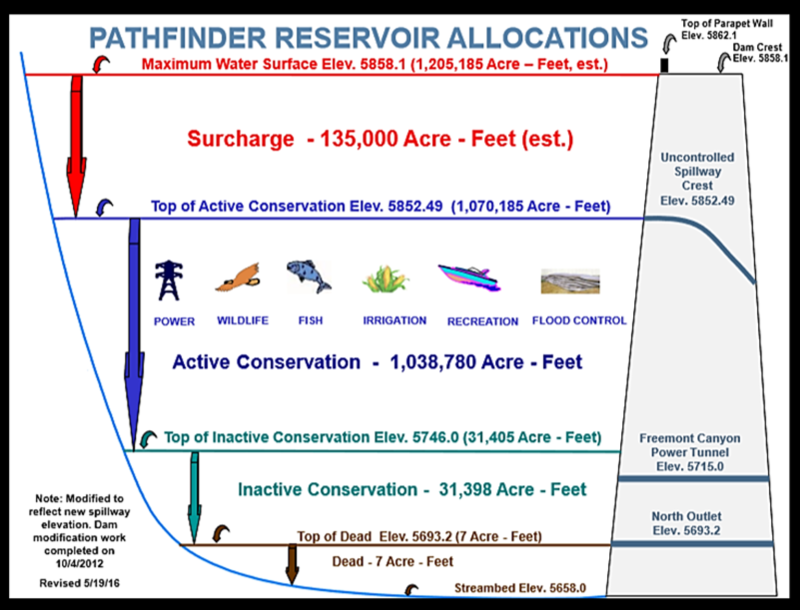 Water allocations for Pathfinder Reservoir. 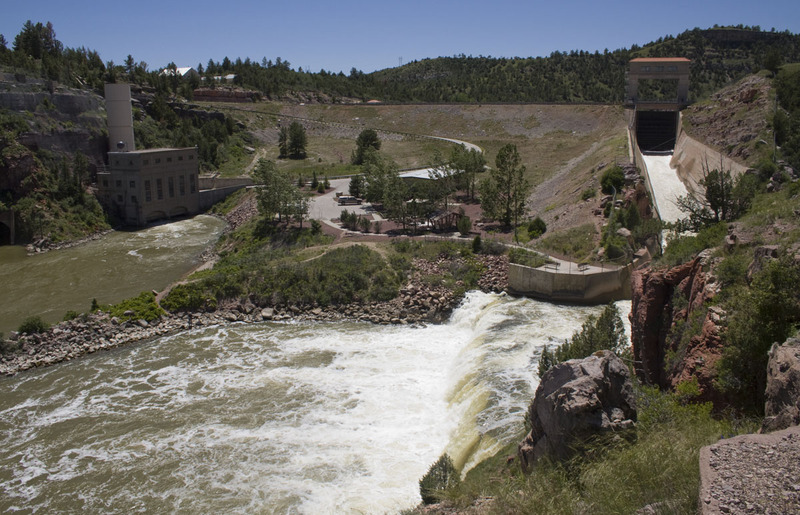 ​The dam is situated just north of the canyon on the backlimb of Alcova anticline. The engineers believed that the Permian Goose Egg Formation would provide a better foundation than the porous Pennsylvanian Tensleep Sandstone that is in the core of the structure. The anticline is elevated by a southwest directed basement fault that trends to the northwest. The fold is a backlimb tightening anticline (shown at location “C” on cross section A-B below) developed on the north limb of the Granite Mountains arch (Sweetwater Uplift). Geologic context of the Alcova area. Geologic codes: Kcv, Kmt, Kf: Cretaceous Cloverly, Meeteetse-Thermopolis, and Frontier Formations; Js-Jm: Jurassic Sundance and Morrison Formations; Trc: Triassic Chugwater Group; TrPg: Triassic-Permian Goose Egg Formation; Pt: Pennsylvanian Tensleep Sandstone; Mm-MDef: Mississippian Madison Limestone and Devonian Englewood Formation and Fremont Canyon Sandstone. South view of Alcova Anticline circa 1933 where the dam was later built. Image: After Cassity, M., 2013, Building Up Wyoming: Depression-Era Federal Projects in Wyoming, 1929–1943, Image on p. 79, http://wyoshpo.state.wy.us/pdf/BuildingUpWyoming.pdf. 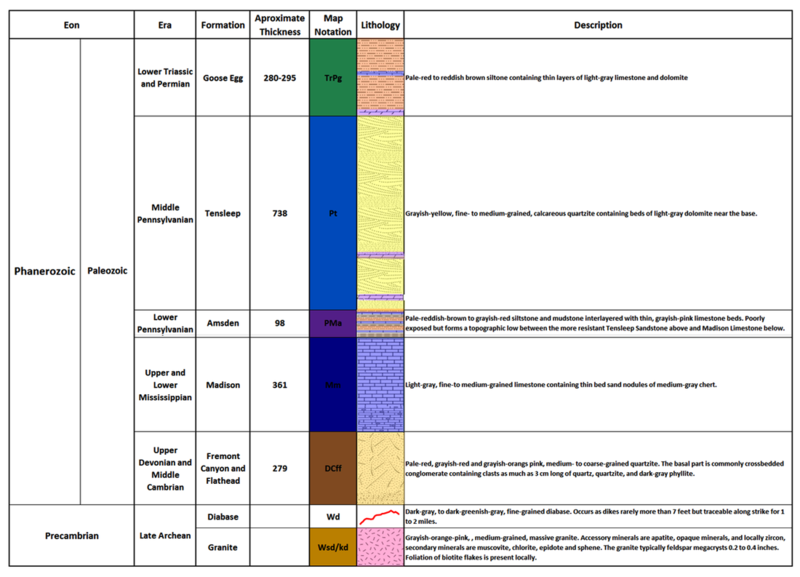 Stratigraphic column for Alcova and Gray Reef Dam Sites. 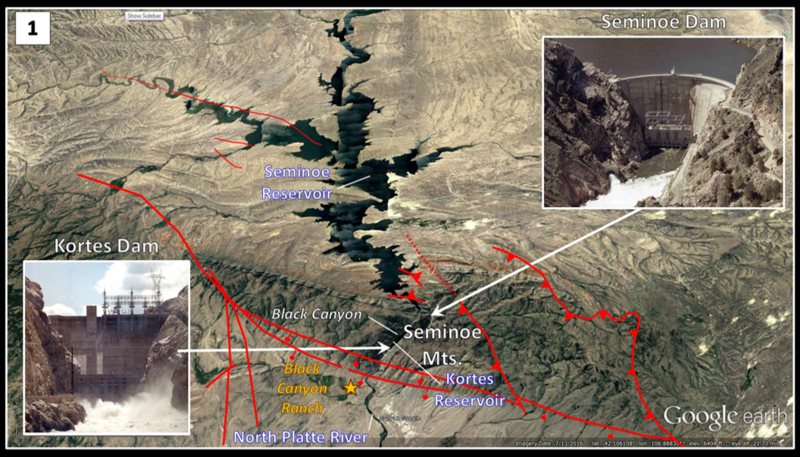 The Alcova Dam foundation is in the Permian Goose Egg Formation. The Grey Reef Foundation is in the lower Cretaceous Cloverly (aka Lakota) and Thermopolis Formations. South view of Alcova dam. 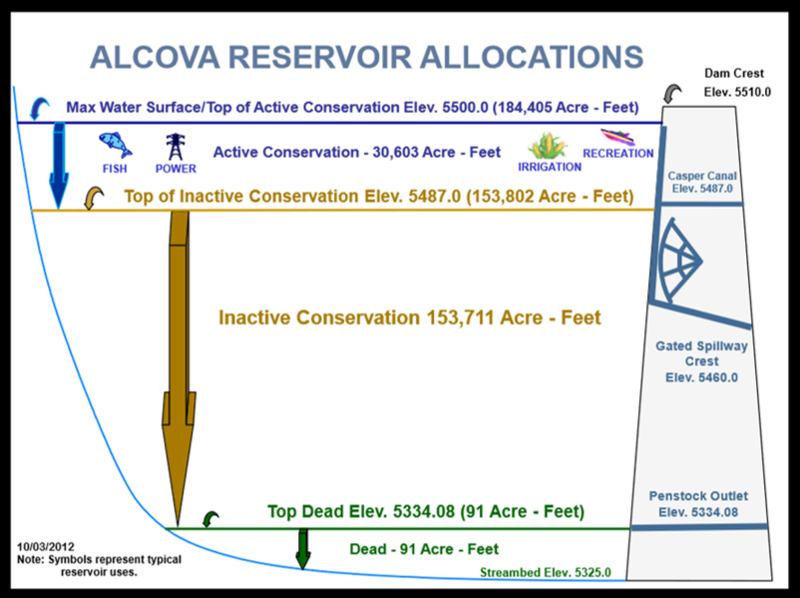 Water allocations for Alcova Reservoir. ​About a mile and a half downstream, just past the next western meander loop of the river, is Gray Reef Dam. 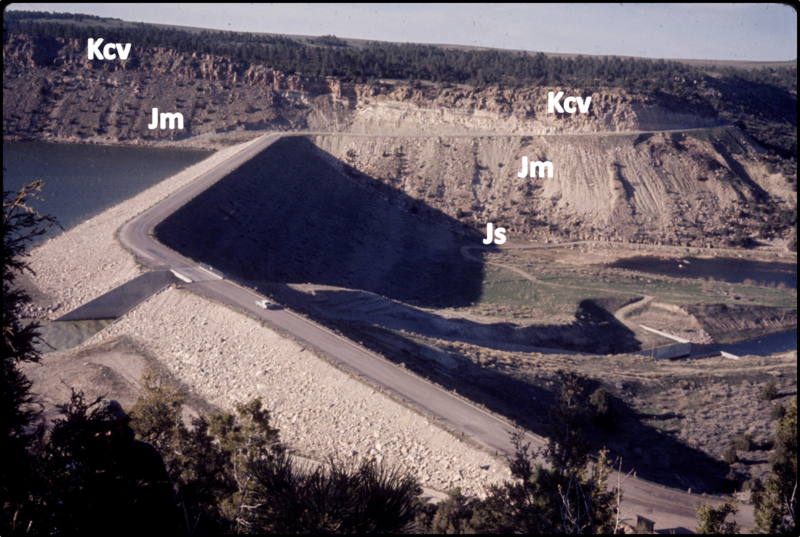 The original chosen dam site in the Jurassic Morrison Formation was found unsuitable for construction due to potential for leakage and the location was moved downstream about 300 feet. Here the right abutment is adjacent to the Cretaceous Cloverly Formation and the left rest on Cretaceous Thermopolis Formation. The primary purpose of this small impoundment is to regulate the flow downstream. Southeast view of Gray Reef Dam. 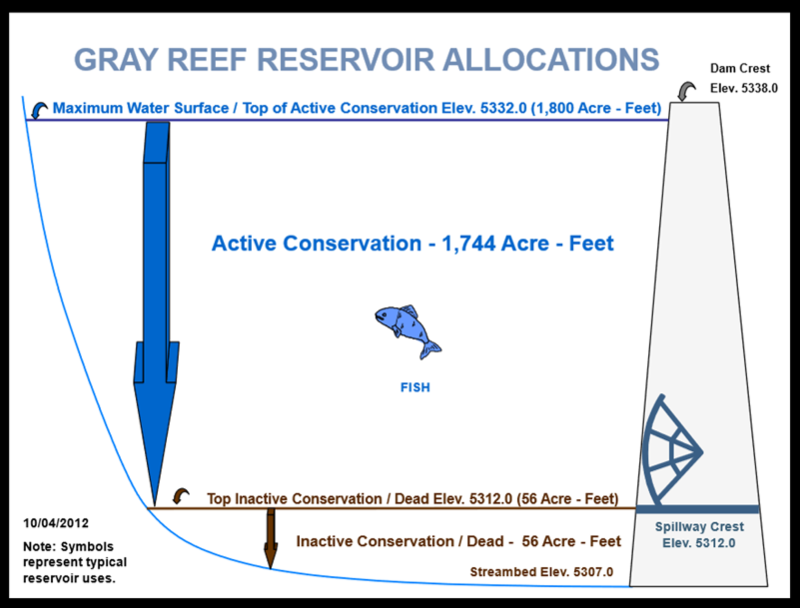 Water allocations for Gray Reef Reservoir. 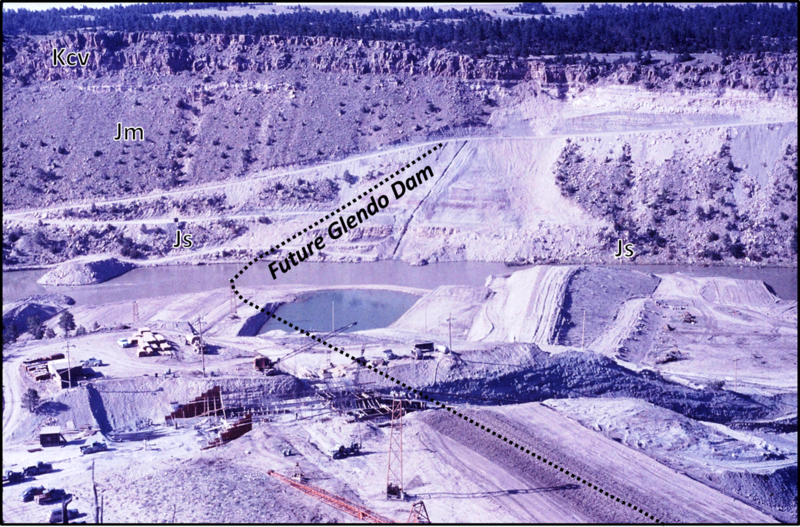 Glendo Dam site geology during construction. Geologic codes: Kcv: Cretaceous Cloverly Formation, Jm: Jurassic Morrison Formation, Js: Jurassic Sundance Formation. North view of Glendo Dam. Image: After Digital Collections of Colorado, Colorado State University Photo wmla 14805171,https://dspace.library.colostate.edu/bitstream/handle/10217/72928/wmla14805171.jpg?sequence=71. ​Glendo Dam is located on southeast dipping Mesozoic rocks at the mouth of Wendover Canyon, 155 miles downstream of Alcova Dam. The basal sandstone of the Cretaceous Cloverly Formation is exposed along the ridge of the gorge at the dam site. The Jurassic Morrison and Sundance Formations form the slope and base of the canyon walls. Older sedimentary rocks are exposed upstream in Red and Platte River Canyons. The Pennsylvanian Hartville Formation is the oldest exposed unit along the northern portion of Glendo Reservoir. Horizontal beds of Tertiary sediment lap over older Mesozoic and Paleozoic units on both sides of the reservoir. These are Oligocene- and Miocene-age remnants of fill that covered the Rockies and extended onto the Great Plains. Elevations range from 4,500 to about 5,100 feet in the area. Stratigraphic column of Mesozoic Formations exposed at the Glendo Dam site. The Sundance Formation is the bedrock for the dam foundation and, with the Morrison Formation, for the abutments. Image: After Love, J.D., Denson, N.M., and Botinelly, T., 1949, Geology of the Glendo area, Wyoming: U.S. Geological Survey Oiland Gas Investigations Map OM-92, Sheet 2, https://ngmdb.usgs.gov/Prodesc/proddesc_5455.htm. 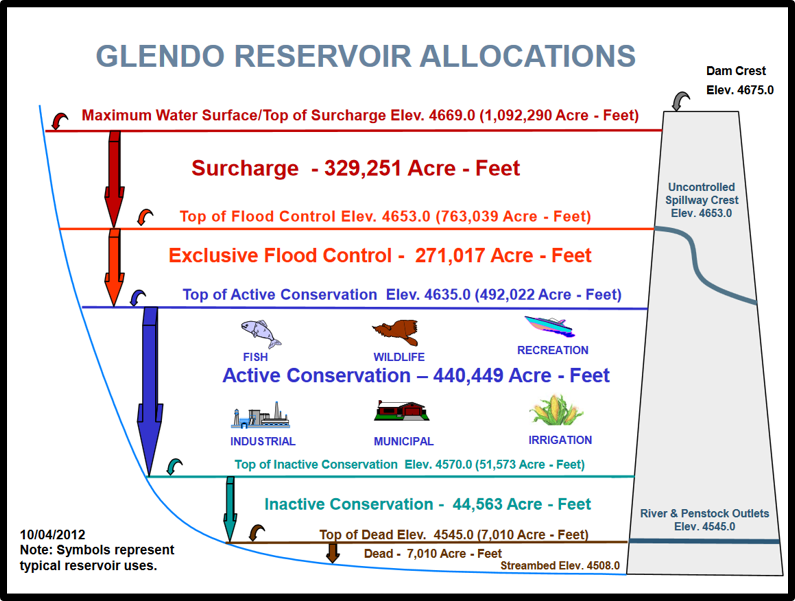 Water allocations for Glendo Reservoir. ​Guernsey Dam is in a canyon carved along the southwestern margin of the Hartville Uplift. It is the last U.S. Bureau of Reclamation along Wyoming’s North Platte River. The foundation rests on Pennsylvanian Hartville formation. Lower Paleozoic to Precambrian rocks poke through the Tertiary fill in the area to the southeast. The Archean rocks include metasedimentary and metavolcanic units that are part of the Central Wyoming greenstone belt. This diverse complex of rocks represents ancient basins that formed along the margins of the Wyoming Craton extending from the Granite Mountains to the Hartville Uplift. They were deformed, metamorphosed, and enfolded as terranes accreted to form the future Equality State. In the Guernsey area the North Platte River flows southeastward within an inner boggy valley with terraces surrounded by higher pediment surfaces and canyons cut in the older Paleozoic rocks. 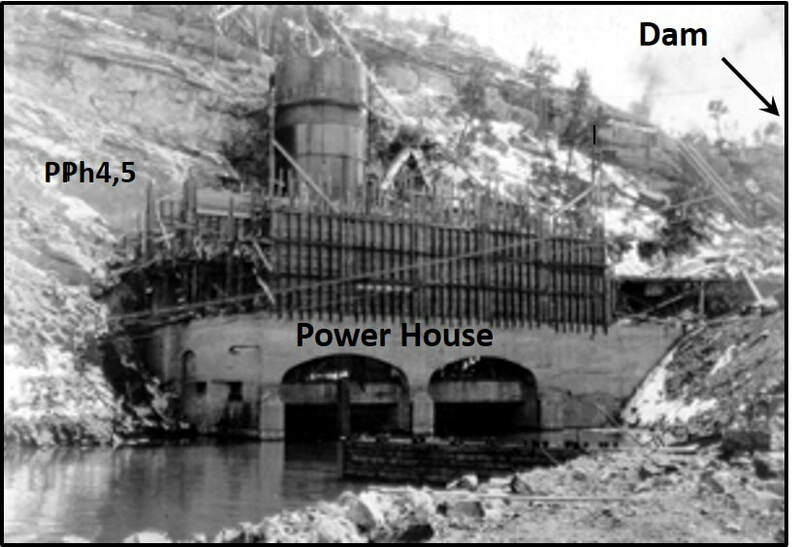 Guernsey Dam and power plant under construction. Southwest view of Guernsey Dam. Stratigraphic column for the North Platte canyon in the Guernsey Dam location. The dam foundation lies on Division IV and V of the Pennsylvanian Hartville Formation. Image: After Denson, N.M., and Botinelly, T., 1949, Geology of the Hartville uplift, eastern Wyoming: U.S. Geological Survey Oil and Gas Investigations Map OM-102, https://ngmdb.usgs.gov/Prodesc/proddesc_5247.htm. Central Wyoming Greenstone Belt (shaded light green) are aligned with Archean suture zones. 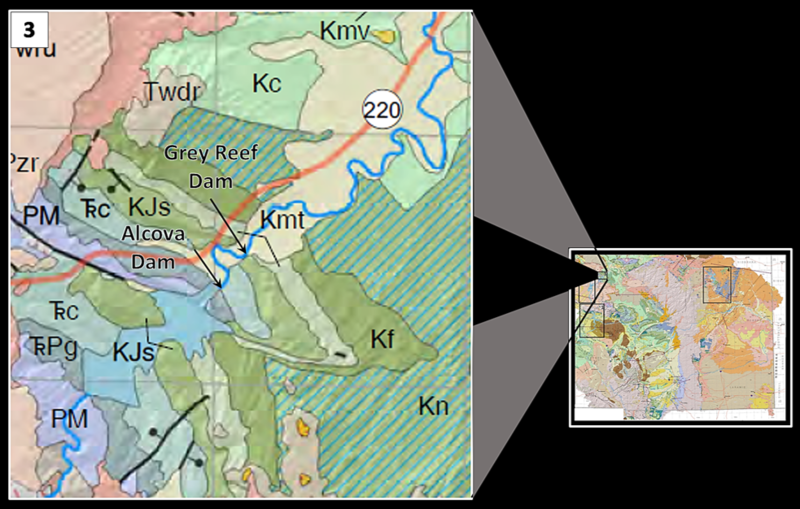 West to east correlation of Archean greenstone complexes in south-central Wyoming. Location of cross section shown on Wyoming greenstone terrane image by dotted black line. Abbreviations: CM: Copper Mountain, CpM: Casper Mountain, ER: Elmers Rock, GM: Granite Mountains, HU: Hartville Uplift, LM: Laramie Mountains, MBM: Medicine Bow Mountains, SiM: Sierra Madre, SM: Seminoe Mountains, SP: South Pass, SR: Sellers Rock. Red dashed lines show Archean basin boundaries (suture zones) with age in billions of years (Ga) labeled. The Cheyenne Belt (CB) suture zone with the Colorado Province shown by solid red line. Image: After Houston, R.S., Erslev, E. A., Frost, C. D., Karlstrom, K. E., Page, N.J., Zientek, M. L., Reed, J. C., Jr., Snyder, G. L., Worl, R. G., Bryant, B., Reynolds, M. W., and Peterman, Z. E., 1993, The Wyoming province, in Reed, J. C., Jr., Bickford, M.E., Houston, R.S., Link, P.K., Rankin, D.W., Sims, P.K., and Van Schmus, Precambrian: Conterminous U.S: Boulder, Colorado, Geological Society of America, The Geology of North America, v. C-2, Fig. 13, p. 146. Guernsey Reservoir area geologic cross section. Precambrian rock of the Central Wyoming greenstone belt shown of the right-hand side of the section. Image:Ver Ploeg, A., Taboga, K., and Taucher, P., 2013, Chapter 4, Geologic Setting: Groundwater Study Level I, Platte River Basin Water Plan, http://waterplan.state.wy.us/plan/platte/2013/gw-finalrept/gw-ch04.html. 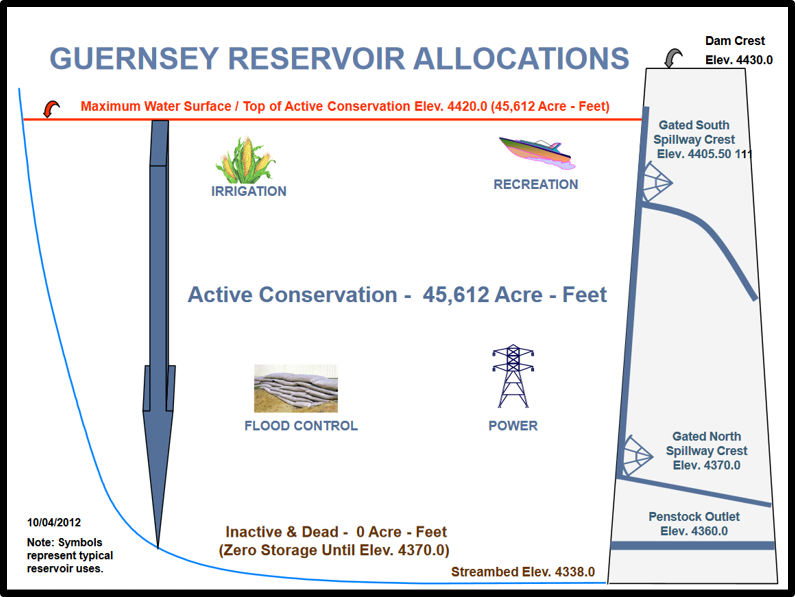 Water allocations for Guernsey Reservoir. The North Platte River Basin was where some of the first bits of continents rose above the primordial ocean. As plate tectonics continued, accretion of terrestrial blocks formed proto-continents. Ancient marine basins sediments and igneous rocks were crushed between accreting island arcs and continental masses. Repeated collisions generated Himalayan-scale mountain belts and basins in Wyoming during the Precambrian. The Pathfinder Uplift of the Ancestral Rockies rose in the area from Laramie to Casper when South America crashed into North America in the Paleozoic. After the Laramide elevation of the Rocky Mountains in the latest Mesozoic and early Cenozoic, erosion by water, wind and gravity soon filled the basins with sediment that lapped up and over the mountains. Only the highest peaks poked through the blanket of sediment. Then beginning about 17 million years ago the Rocky Mountain region began to rise. The rejuvenated streams carved down through the soft sedimentary layers into the crystalline basement rocks. The topography created by the streams provided the U. S. Bureau of Reclamation ideal locations for their water development projects. The basin was also the home of Fort Laramie, the first Army Post in Wyoming. It was the path emigrants traveled over the Rocky Mountains on the road west. The Pony Express followed the same route. The southeastern part of the state is where Wyoming’s stock industry began. The Union Pacific selected the gangplank for the path of the Transcontinental Railroad. The U.S. Bureau of Reclamation constructed seven dams along the river to promote the development of Wyoming. The North Platte River region has the most irrigated land in Wyoming. It also has the highest population density in the state, with the three largest cities: Cheyenne, Casper, and Laramie. All the human history took place on a part of the earth with well over three billion years of geologic history. And that is the end, and the beginning, of seven dam things along the North Platte.